LG’s handsome G4 is packed with a professional-grade camera, 32 GB internal memory and a Qualcomm Snapdragon 808 processor all properly packaged… in leather. Yes, you read that right: vegetable dyed, 100% pure grain leather is just one of the finishes you can choose for this device. G4 is the first smartphone to use LG Display’s new 5.5 inch IPS Quantum Display technology which offers 20% greater color reproduction. The 16 MP rear camera features a wide F1.8 aperture lens allowing 80% more light to reach the sensor to improve the quality of photographs taken in low light situations. Manual Mode allows experienced photographers greater creativity to control focus, shutter speed, ISO exposure and the ability to save photos in RAW mode. LG rounds out the enhancements with an 8 MP front-facing camera and Gesture Interval Shot which takes four shots two seconds apart, increasing the chance to capture the perfect moment. 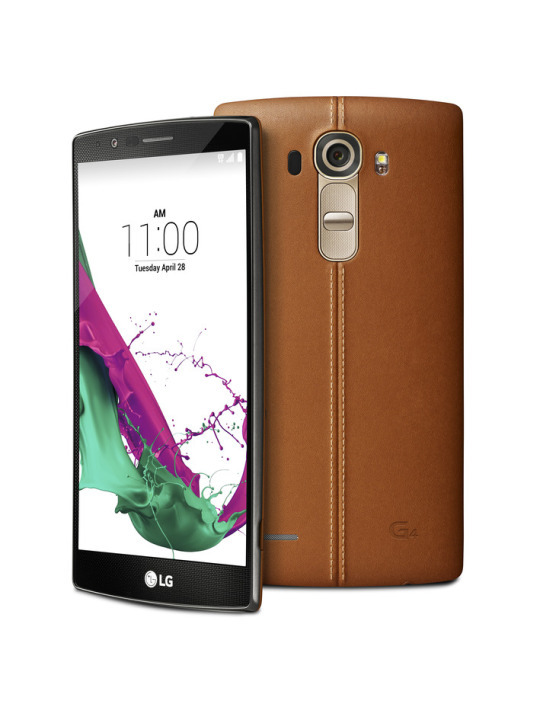 With all of the photographic enhancements and luxe finishing, the LG G4 is a smart (and good-looking) choice.